I love tiling theory. It’s a branch of mathematics that brings together many beautiful ideas, and that offers a lot of open questions for exploration. And of course, it gives us tools to apply mathematics in the world of art and design. Normally, in my research as a computer scientist I apply tiling theory to create interesting pictures. But when I can, I also enjoy probing at the underlying mathematics. Recently I made a few small discoveries as part of my interest in Heesch numbers, and I thought I’d share them on this blog. I’ll do so in posts to follow. But first, here’s a preliminary post that introduces the ideas that are needed to understand what’s coming. Every copy of meets in at least one point. In other words, every copy is doing useful work as part of surrounding . Every point of is completely inside the blob. No point of ‘s boundary makes contact with the outside world, not even at corners. If can be completely surrounded in this way, we refer to the copies defined above as a “corona” of . My earlier study of coronas is also what led to the development of the game Good Fences; in fact, I originally called the game “Corona” but didn’t want to release it under that name for fear of incurring the wrath of Anheuser-Busch InBev. Once we can surround a shape with a corona, it’s natural ask whether we can surround that by a second layer, a third layer, and so on. In mathematical terms, we generalize the definition of corona to a -corona: a -corona of is itself, and a -corona is any surround of any -corona of , still using transformed copies of . We’re now ready to define the Heesch number of a shape as the largest for which has a -corona but not a -corona. We’ve built up a bit of mathematical machinery to get to this point, but a shape’s Heesch number is easy to understand intuitively: it’s the maximum number of complete layers you can place around the shape before you run out of every possible opportunity to build another layer. What’s less obvious is whether there’s anything in between 0 and . Is there some shape (for simplicity, let’s assume it’s a polygon) that can be surrounded by layers for some finite , but never more? Note that any drawing of a corona doesn’t settle the question of the shape’s Heesch number! The corona could be surroundable, or perhaps a different corona could be. The diagram shows that the Heesch number is at least 1; you’d need a more thorough argument to know that it can’t be higher. Today we refer to Heesch’s problem: for which finite does there exist a shape with Heesch number ? We can ask a whole host of related questions. Is there an upper bound on finite Heesch numbers? Are there positive integers that can’t be Heesch numbers? Are there limitations on Heesch numbers for specific classes of shapes, e.g., polyominoes? 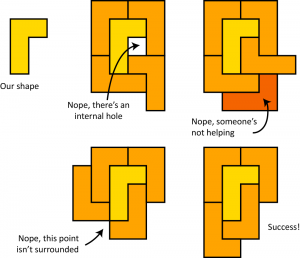 At this point, it would be natural to ask: if non-trivial Heesch numbers are all about shapes that don’t tile the plane, then what do they have to do with tiling theory? 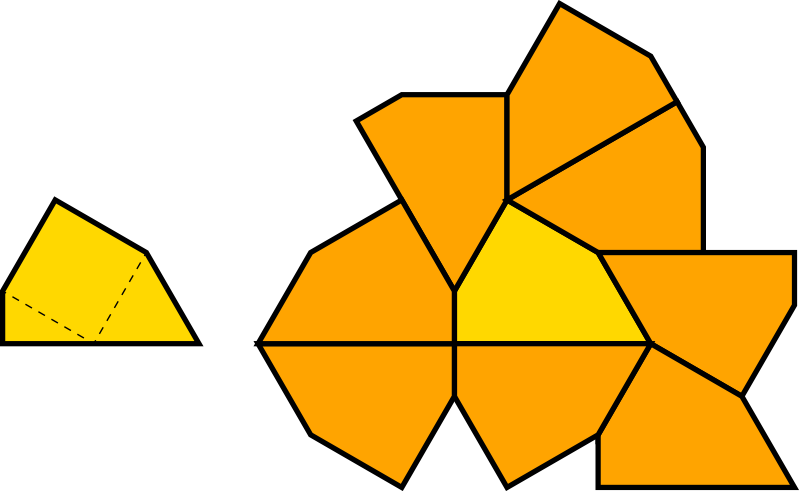 Well, if you know something about a shape’s Heesch number, you also know whether it tiles. So let’s say that somebody managed to prove that no shape could ever have a Heesch number bigger than, say, 17. 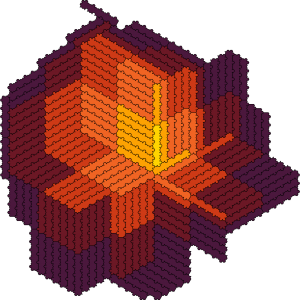 Suddenly, we have a nice algorithm to check whether a shape tiles: just surround it 18 times! 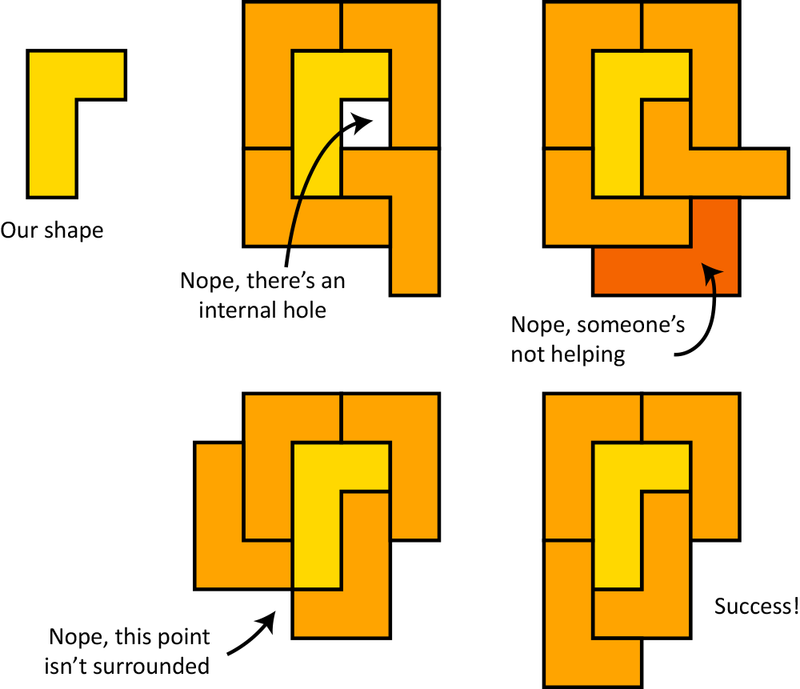 Either you fail to reach 18 coronas, in which case you know the shape doesn’t tile, or you succeed, in which case the shape must tile, because you were told that every shape that didn’t tile reached at most 17 coronas. That would be a big deal, because at present we don’t know of any systematic way to check whether a single shape tiles the plane. I guess that there ought to be some relationship between “tiling theory” and “non-tiling theory”, after all. For my part, I find the topic endlessly fascinating. A high finite Heesch number represents a kind of spooky action at a distance. How is it that we can “program” the boundary of a shape in order to determine—and limit—what happens five layers out? How can we get control over that behaviour in order to construct shapes with desired Heesch numbers? I find it amazing that the geometric structure of the plane allows us to play such wonderful games. Armed with the definition of Heesch number, and a few simple examples, I’m ready to offer a few new discoveries in the posts to follow. I’ll need a small amount of additional terminology from tiling theory, which I’ll introduce as necessary. Next up, simple polyforms with non-trivial Heesch numbers. 8 Responses to "Heesch numbers, Part 1"
Looking forward to the followup. To add, your game is utterly cool! It seems to me that there can not be an upper bound on the Heesch number. This feeling stems from the fact that you could solve the Halting problem with it. For the question of tiling the plane is undecidable, and the outline in your post shows how to determine tile-ability when the Heesch number is bounded. I realize that this does hinges on the fact that determining the Heesch number for a tile is decidable. Brute forcing seems to offer a answer, at least for polygonal tiles. That’s not quite right. You’re right that the general tiling problem is undecidable, but it’s not known whether it’s undecidable for the special case of a single tile. 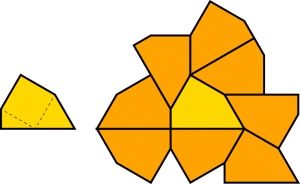 This question is critically connected to the open problem of whether there can exist a single shape that tiles the plane only aperiodically (though even then, the existence of a so-called “einstein” wouldn’t be guaranteed to render the tiling problem undecidable). There’s nothing about the undecidability of the general tiling problem that forces Heesch numbers to grow without bound. If I had to place a bet, I’d put my money on Heesch numbers growing without bound. But that’s mainly an argument from aesthetics—the geometric structure of the plane would simply seem a bit less elegant, a bit tarnished, if Heesch numbers were found to be capped at some arbitrary limit like 5, or 12, or 197.